Rebellion – the results are in! 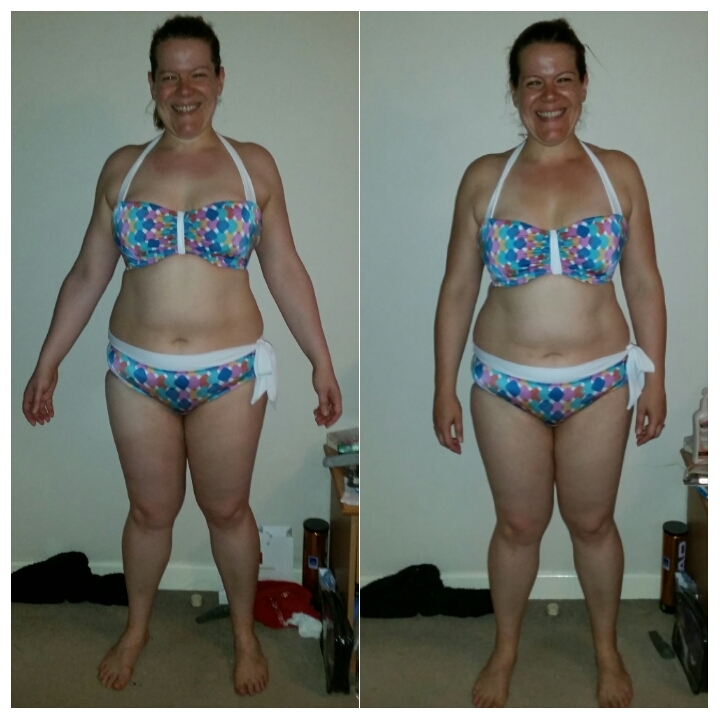 Last Sunday saw the end of the 12 week Rebellion programme that I’ve been following over on Julia Buckley’s members website Extreme Inferno. 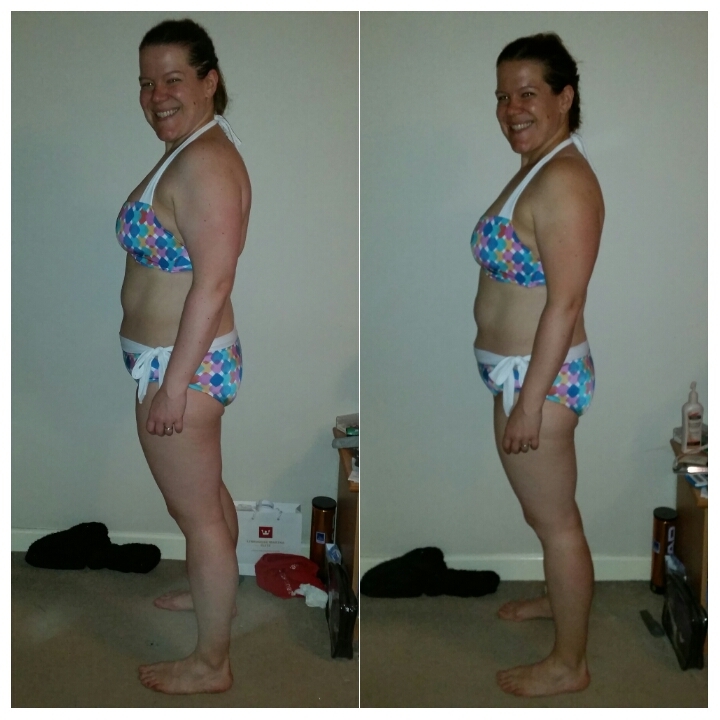 It’s the third of Julia’s 12 week programmes that I’ve followed after The Fat Burn Revolution and Extreme Inferno and I think all things considered it’s been my favourite so far. I’m actually on holiday in Australia right now (more on that in another post) so I took my end of programme shots just before we left to come away and I’m really pleased with what they show. 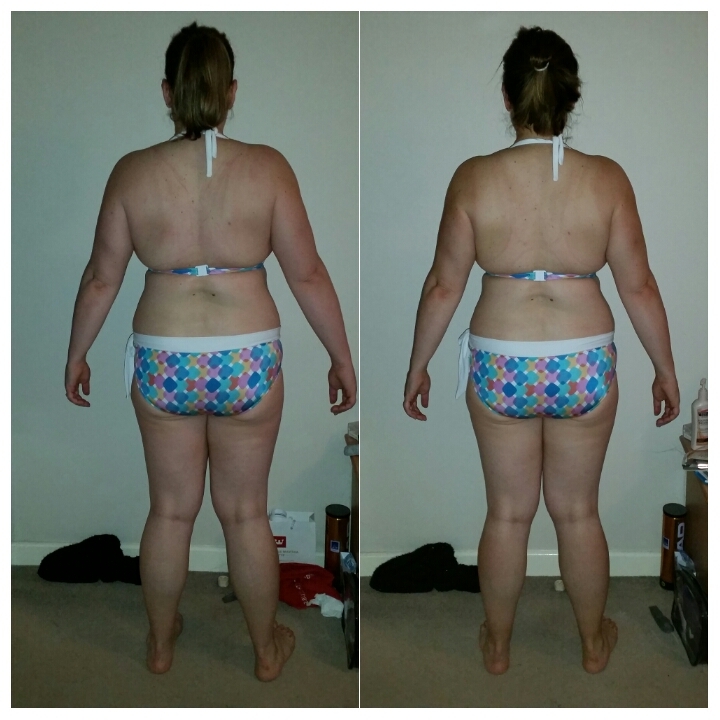 I’ve been training like this for over two years now so I’m not expecting to see dramatic changes in a 12 week period, but these photos show definite changes which makes me very happy indeed. The numbers on the scales haven’t changed dramatically either but both my weight and body fat % are down, as are my measurements. I’ve lost between half an inch and an inch and a half from each measurement spot. I’m quite excited that there’s a hint of some ab definition starting to appear as well! I think that the back shots show the most significant change, particularly across my upper back. So aside from these physical results, why have I enjoyed Rebellion so much? Mainly the format and flexibility that it offers. There are three types of sessions in Rebellion – Sculpt which is strength training, Shred which is high intensity interval training and Sustain which is a combination of yoga style moves and body weight strength work designed to help recovery and flexibility. Julia’s previous programme’s have been a mix of strength work and high intensity sessions and I think it’s the addition of the Sustain section which has really made Rebellion stand out for me. If I’m honest I’m a bit of a slacker on the flexibility and stretching side of things. I know what I need to do, it’s just a matter of making myself do it. As I’m in my early forties I am becoming more aware of the fact that I’m not getting any younger! I intend to life a long and active life and if I want to do that then this type of work is exactly what I should be making time for. 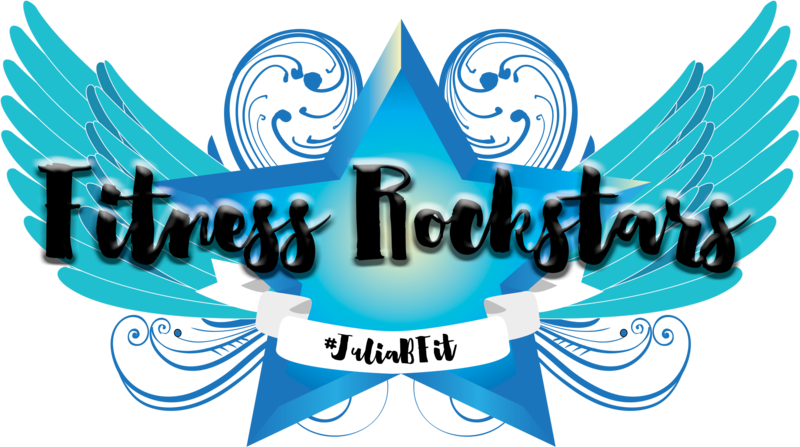 By incorporating it within the programme, Julia has helped me focus on this aspect of my training as much as the other parts and has in some ways given me ‘permission’ to count a 20 minute flexibility session as ‘a workout’ – something that I would previously not really considered that way. 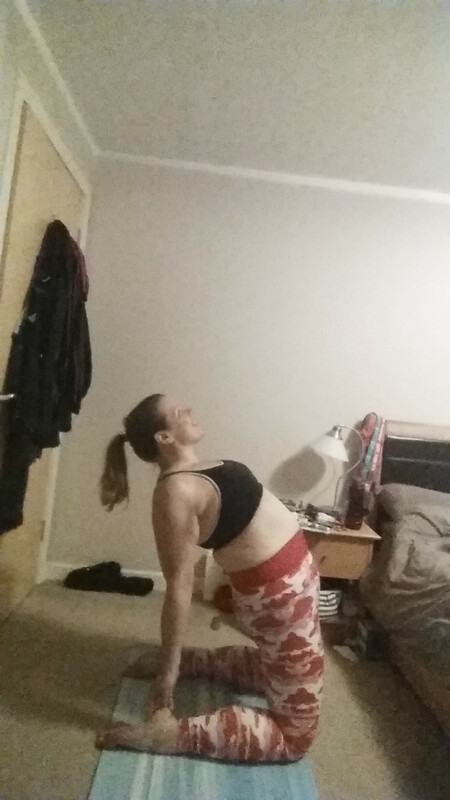 Camel pose. This is not easy, but it feels amazing. When you’re used to working at your max and pushing yourself very hard I think it can become difficult to recognise that other, less intense sessions also ‘count’ and can be just as, if not more beneficial to long term health and fitness. I’ll admit that I’ve occasionally got myself into the mind set of thinking that if I’m not lifting my heaviest weight, or taking my heart rate to its max, then it’s not a proper workout. Sustain has helped me to see that that isn’t true. And if I’m making it sound like Sustain sessions are easy, then believe me they’re not, they’re challenging but in a different way! The flexibility of the programme has also been fantastic. 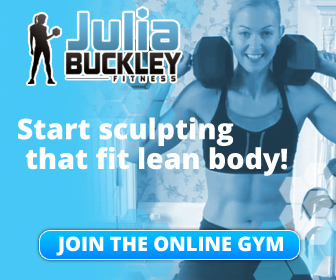 While a full Rebellion session would include 3 x 20 minute workouts – one each of Sculpt, Shred and Sustain, Julia has recorded them all as individual workouts so we are able to pic and mix as we want to. This has worked really well for me and enabled me to fit Rebellion around the other training that I do. There’s another round of Rebellion kicking off on September 28th and I’m really looking forward to getting stuck back in again. Having done Julia’s other programmes multiple times before I know that exciting things can happen second round through when the sessions are familiar and you can really dig in right from the start. 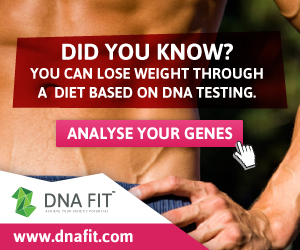 If you’re interested in finding out more then head over to Julia’s website. Previous The future of food?